In this blog, we are going to explain in detail how to process and obtain your company’s tax clearance certificate in Nigeria for new registered companies, old registered companies but fresh application and TCC renewal. You will equally explain what Company Tax Clearance Certificate is and the benefits in Nigeria. In Nigeria, Tax Clearance Certificate for corporate entities (Companies) are issued by Federal Inland Revenue Service (FIRS) of Nigeria. Before I conclude that everybody knows what “Company Tax Clearance Certificate” is in Nigeria. Let me ask and answer these two important questions. What is Tax Clearance Certificate in the Nigerian context? Why do I need Company Tax Clearance Certificate in the Nigerian? Back to Steps on processing and obtaining your Company Tax Clearance Certificate in Nigeria. I want to make it clear here that you can process and obtain your Company’s Tax Clearance Certificate in Nigeria on your own. But, you will face some challenges when you are not knowledgeable enough in Nigerian tax matters. My advice is, you should use a consultant for your Company’s Tax Clearance Certificate processing in Nigeria. The following steps will guild you whether you are processing it by yourself or you are hiring a consultant. Tax consultant will undergo these similar steps also. Step One: Companies should visit any FIRS branch around them in any state in Nigeria. FIRS normally have office in every state in Nigeria. Company Tax Clearance Certificate process starts with obtaining your company’s Tax Identification Number (TIN) from FIRS where such is not in existing already. Tax Identification Number (TIN) is free of charge service from FIRS and can be obtain within one working day. If your company account or TIN is in a location that is not convenience to you, you can apply for your company’s Account or TIN redirection to FIRS branch that is convenience for you. This is also a free service that requires no cost. Every company operating in Nigeria has the right to move his/ her company’s Tax Account from one location to another. Mainly to a location that is more convenient to you as a company. Step Two: Apply For VAT where one is not in existence. Value Added Tax (VAT) certificate is also free of charge from FIRS in Nigeria. Step Three: Apply For Company’s Tax Clearance Certificate from FIRS. Note: It is your right to apply for your company Tax Clearance Certificate in Nigeria as early as possible so as to enjoy the first year waver. Company Tax Clearance Certificate is free when you apply for it within the first six month your company was incorporated. That is, the registration or incorporation date of the company is not more than six (6) months. After completing the taxpayer registration input form and all documents, a tax reference number will be allocated for your application. There are two types of assessment, pre-operation and post operation assessments. I must mention that at this stage, you really need a consultant or expert to scale through freely especially for post operation assessments. For companies that are yet to commence business and show up for registration after 6 months of incorporation, a pre-operation levy of Naira 25,000 will apply for the for the first time and Naira 20,000 is payable for subsequent years until it files a notice of commencement of business. Pre-operation assessment is assessments made on companies that have not started business operation, but are registered in Nigeria with CAC. Post operation assessment: This is assessment made based on your business activities operations. Your company Financial Statement is required at this stage. A Financial Statement prepared, signed and stamped by qualified auditors. The Financial Statement for a company in operation also includes the company’s estimated tax payable in the year. This estimated amount of tax payable in company’s Financial Statement is the amount of tax your company is telling the FIRS that you are liable to pay. Most at times, the figure in your company’s financial statement and the FIRS computed figure are not always the same. You can challenge the figure, where the figure in your account is not the same and you could not agree with FIRS officer on the payable tax figure; the law permit you to go to the court. But you should know that there no court of law that will grant you an indemnity on what you spent even when you win FIRS is wrong. This is not a step, but an advice to every tax payer. You need a consultant for filling and obtaining company’s tax clearance certificate in Nigeria. You have a lot to gain when you engage them. The role of the consultant is very critical as their handling of your case with the authorities usually determines if the tax man will accept your figures and give you a tax clearance certificate on time. In a situation where the account you prepared is not acceptable to the FIRS authorities, they can by law use a Best of Judgment (BOJ), their discresion decision to compute the amount of tax you should pay. This is often a drastic and unfavourable scenario for the tax payer. However it can be minimized or all together avoided. 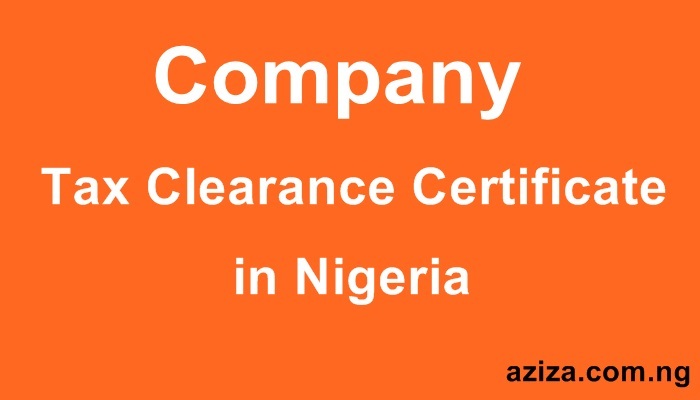 Aziza Nigeria process and complete Company Tax Clearance Certificate within two(2) weeks. We serve companies all over Nigeria.